What's better than a pair of ruby slippers? Click here to play! Pure rubies, of course. And what's better than pure rubies? Massive cash jackpots! Slip into this colorful slot machine today for your chance at winning unthinkable treasures. 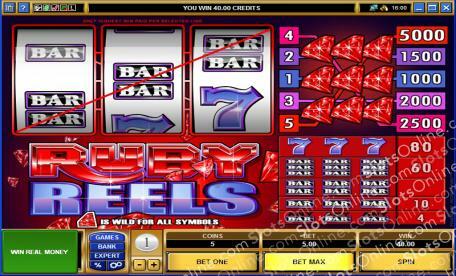 Ruby Reels is a wonderful little slot played across three reels and five pay lines. The more pay lines opened allows more combinations to be made, and you can bet up to 5 coins each time you spin. The Bars are lucrative, as are the lucky Sevens; however, if you are looking for the big payouts, then keep the reels firmly planted on the Rubies. The Ruby symbol is Wild and can be substituted for any other symbol in order to complete winning combos. Depending on which line you spin three Rubies on, you will be paid out accordingly. So, if you land three Rubies on the first pay line, you will win 1000 coins, whereas if they were to land them on the fifth pay line, you would win 5000 times your bet. Take yourself down to the Ruby Reels today! The Ruby is Wild and can be substituted for any other symbol on the reels to finish off winning combinations.